With those views, I can really imagine that this is considered the most scenic drive in the world by some. Fantastic picture [composition]. It’s one great view after another for 144 miles. You’ll have to extend the list of states in which you’ve ridden your bike at least 10 miles to include Canadian provinces. If you go to the Canadian Rockies you can check off Alberta and British Columbia on the same visit. You’ll see Bow Lake in a different way next time. Well, Canada would be a great addition, but I think we’ll be hard put to get the US states on that list. There are so many other places outside the US to visit, too. A citizen of the world, then. A perfect picture of the place, Steve! You’ll see more of it (actually less of it) next time, Indira. Here’s another very elegant photo from you. I’m always glad to be considered a delegant of elegant. But not to an elephant. An excellent drive. Something good to see around the next curve, over the next hill. Definitely excellent. If only there hadn’t been so many other people around the next curve, over the next hill, and at every scenic stop. Very beautiful – one for a frame!!! In our house I recently put up some of my nature pictures. They’re printed on metal and have no frame. Wow, Steve! Another favorite for me from this series. “Sweep” was the word that popped into my head… looks like Mother Nature got her broom out! That’s a good way to put it: the mountain does seem to have been piled up in a bold sweep. I’m glad to hear you got swept up in this picture. 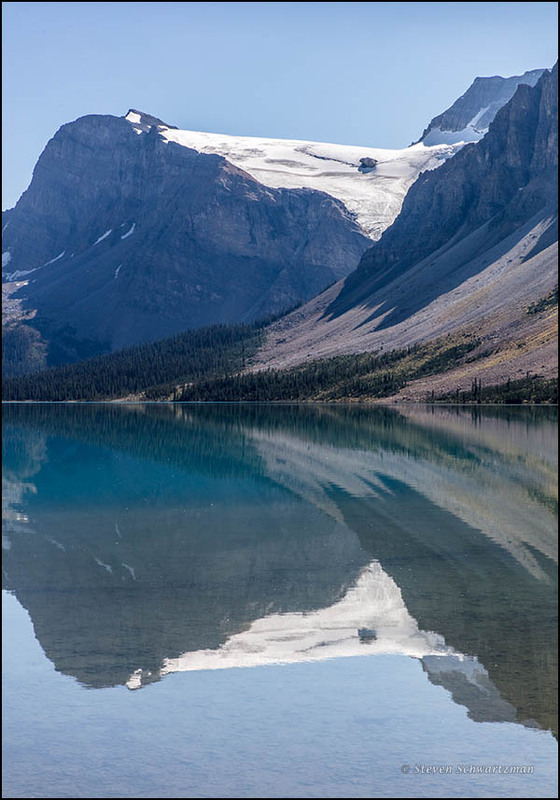 Bow Lake seems especially appropriate, since the sweep of the mountain in front of the glacier and its reflection in the water resemble an unusually graceful arrowhead. Your comments, always to the point, are especially apt in the metaphor you’ve put forth here. A very beautiful place, Steve! I love the composition of that photo with the reflection. Reflections turned out to be an important part of this trip. I did a lot with them at Bow Lake and then at other places, particularly some ponds on the eastern side of Jasper National Park late on the same day and for the next two days. A couple of those later reflection pictures will eventually appear here. Yet another reason for you to put the Canadian Rockies near the top of your list of places to visit. It certainly is. We were happy to find many scenic lakes and mountains in the area.